Mémoire (au Québec: Fête) des saints Joachim et Anne, les parents de la Vierge Marie immaculée, Mère de Dieu, dont les noms ont été conservés par d’antiques traditions chrétiennes. Église militaire de Jean Népomucène, Hradschin, Prague. All our information concerning the names and lives of Sts. Joachim and Anne, the parents of Mary and grandparents of Our Lord, is derived from apocryphal literature, the Gospel of the Nativity of Mary, the Gospel of Pseudo-Matthew and the Protoevangelium of James. Though the earliest form of the latter, on which directly or indirectly the other two seem to be based, goes back to about A.D. 150, we can hardly accept as beyond doubt its various statements on its sole authority. In the East the Protoevangelium had great authority and portions of it were read on the feasts of Mary by the Greeks, Syrians, Copts, and Arabians. In the West, however, it was rejected by the Fathers of the Church until its contents were incorporated by Jacobus de Voragine in his “Golden Legend” in the thirteenth century. From that time on the story of St. Anne spread over the West and was amply developed, until St. Anne became one of the most popular saints also of the Latin Church. The Protoevangelium gives the following account: In Nazareth there lived a rich and pious couple, Joachim and Anne. They were childless. 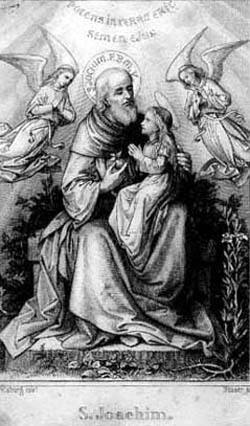 When on a feast day Joachim presented himself to offer sacrifice in the temple, he was repulsed by a certain Ruben, under the pretext that men without offspring were unworthy to be admitted. Whereupon Joachim, bowed down with grief, did not return home, but went into the mountains to make his plaint to God in solitude. Also Anne, having learned the reason of the prolonged absence of her husband, cried to the Lord to take away from her the curse of sterility, promising to dedicate her child to the service of God. Their prayers were heard; an angel came to Hannah and said: “Anne, the Lord has looked upon thy tears; thou shalt conceive and give birth and the fruit of thy womb shall be blessed by all the world”. The angel made the same promise to Joachim, who returned to his wife. Hannah gave birth to a daughter whom she called Miriam (Mary).